Leah Crocetto is from Adrian, Michigan and is a third year Adler Fellow with San Francisco Opera. She was a 2010 Grand Finals Winner of the Metropolitan National Council Auditions; 1st Place Winner, People's Choice and Spanish Prize winner at the José Iturbi International Music Competition and winner of a Sara Tucker Career Grant. This season includes her European debut as Leonora Il trovatore with Opéra National de Bordeaux and as soloist in Mahler's Second Symphony at the Grand Teton Festival, conducted by Donald Runnicles. At San Francisco Opera last season she covered Leonora Il trovatore and Desdemona Otello and this season includes the High Priestess Aida and Opera in the Park with Nicola Luisotti. 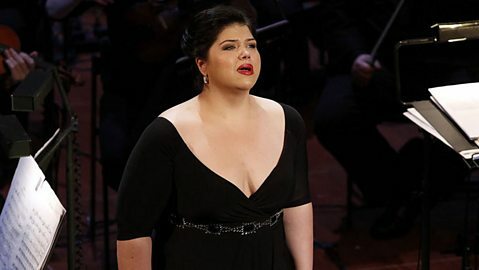 She sang her first performance of the Verdi Requiem in her debut with the Los Angeles Philharmonic and Gustavo Dudamel and will perform it again with Columbus Symphony and Albany Symphony. Leah has an engagement at the Hollywood Bowl singing Beethoven's Ninth Symphony with the Los Angeles Philharmonic and Rafael Frübeck de Burgos. Future plans include Liù Turandot at San Francisco Opera, Desdemona Otello at Frankfurt Opera and the Poulenc Gloria with the Berlin Philharmonic Orchestra. In her spare time, Leah enjoys karaoke, travelling, wine tasting and making mp3 player playlists. Leah Crocetto from USA sings Timor di me? ... D'amor sull' ali rosee from Verdi's Il trovatore.